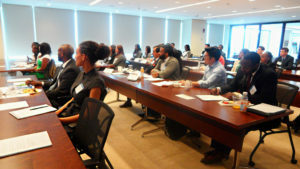 The PDLG fellows Program Judicial Clerkship Seminar is a lunch seminar that gives Fellows the opportunity to learn about hiring criteria and approaches to becoming a judicial clerk, as well as the work clerks do and the expectations judges have for their clerks. The panel consists of Federal and state judges with input from lawyers who have clerked on federal and state courts. The goal is to give the Fellows insight into clerkships and aid in decisions about whether to apply. PDLG holds this seminar because although clerkship information is available at the law schools, not all law students realize this is something they might want to do and might be able to do. It is also helpful to hear directly from the judges and to be able to ask them questions. In past years, the Panel has included judges on the Federal 3rd Circuit Court of Appeals, the Federal District Court for the Eastern District of Pennsylvania, the Philadelphia Court of Common Pleas and the New Jersey Superior Court.